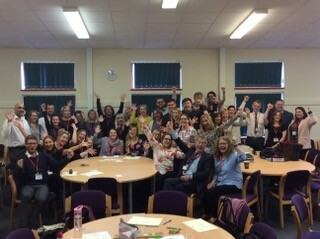 Suffolk and Norfolk SCITT Secondary Salaried trainees almost at the end of their training year! The cohort of 2017-2018 Secondary Salaried trainees attended their last Core Training day this week and you can tell from their faces (not all trainees -spot the trainers too) that they are pleased to be nearing the end of their training. They have about three more weeks in school as many finish in the middle of June so they are all a bit nervous about their SCITT Tutor visiting and conducting their final visit and observation. At the end of June the trainees will then be recommended for QTS and their PGCE from the University of Suffolk. We are delighted that almost all of them have jobs too. They have been a great group of trainees and we will miss them. However, we know that they have a great career ahead of them in our local partnership schools across Suffolk and Norfolk.